What does the Catholic Church REALLY teach? 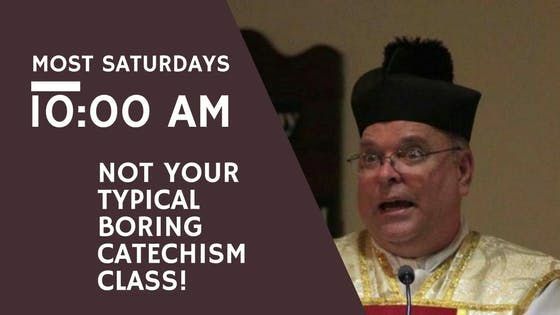 Most Saturdays (check our parish website calendar, www.EpiphanyTampa.com) Father Edwin Palka teaches this class for adults who want to dive into the depths of the True Catholic Faith. Using the Catechism of the Catholic Church, we go paragraph by paragraph and unpeel the layers of meaning behind each teaching of the Church. This is not the deadly boring religion classes of your youth. 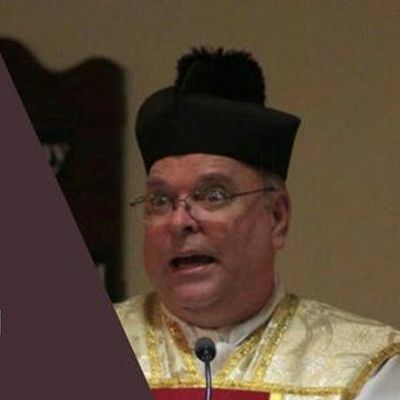 Mixing humor with real-life experiences, Father Palka will help you see why the Catholic Faith is the true faith, why everyone should be Catholic, and what you've been missing all along because your less-than-worthless Catholic education classes leading up to Confirmation consisted in coloring rainbows and butterflies while hearing that all you need to do is "luv" everyone in order to get to Heaven. These classes are worth every dadgum penny of the cost. Father is so sure you will like the class that he offers a double-your-money-back guarantee for these free classes! Plus, no donations or "love offerings" are accepted. Just bring your copy of The Catechism of the Catholic Church if you have one. This is an ongoing class. It is estimated that we will get all the way through the Catechism of the Catholic Church in another 6 years. Obviously, you needn't make that type of commitment. Just come when you can and don't when you can't. Because Father is the only priest at Epiphany, there is always a possibility that a funeral or spiritual emergency or Diocesan meeting will necessitate canceling the class on any particular Saturday, so it is a good thing to check the parish calendar on the web before making the trip. Known cancellations are posted as soon as possible to give as much advance notice as we can. Epiphany of Our Lord is Tampa's Center for the Traditional Latin Mass. It is a parish of the Catholic Diocese of St. Petersburg. Feel free to join us for the 8:00 am Mass and Adoration of the Blessed Sacrament and Confessions before the class begins. Any questions? Call the office at (813) 234-8693.